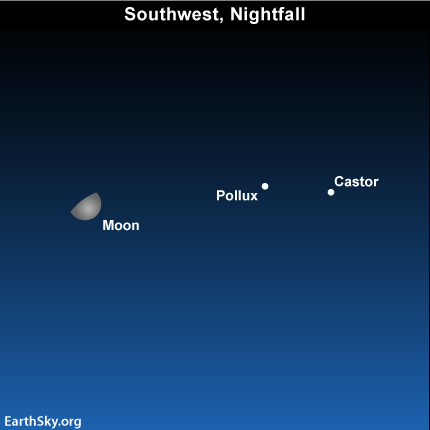 Tonight, the moon shines near Castor and Pollux, the brightest stars in the constellation Gemini the Twins. As seen mid-northern latitudes, the moon and the Gemini stars shine fairly high in the south to southwest sky at nightfall, and all three luminaries set in the west after midnight. As viewed from middle latitudes in the southern hemisphere, the moon, Castor and Pollux sit low in the northern sky at nightfall, and set by mid to late evening. These two stars – Castor and Pollux – were seen as twins in the star lore of many civilizations. Regardless of the seeming connection between these two stars, Castor and Pollux are neither close together nor physically related. They happen to reside along the same line of sight. Castor and Pollux are different kinds of stars. Castor is a hot, white-colored star that is well known for its multiple personality. It consists of three pairs of binary stars – or six stars bound together in an intricate gravitational dance. Pollux is a cool and bloated orange-colored star, said to be the closest giant star to Earth. 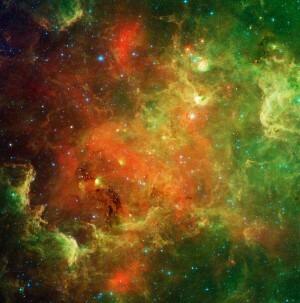 A star swells up into a giant in its old age. The moon passes in front of Gemini for a few days every month. The sun, on the other hand, passes in front of Gemini for one month each year, from about June 21 to July 20.